Students enrolled in the Saybrook University’s School of Mind Body Medicine often tell stories of how they found their way to Saybrook. Many describe their path as a calling, or as an answer to their quest for finding a new way of working with people, one that addresses the many dimensions of human experience. Helen’s story is about meeting a fellow Saybrook student, Beth Haggett, who is also the first student to receive a PhD from Saybrook University School of Mind Body Medicine. While attending a conference facilitated by the Berkana Institute, Helen met Beth, and was moved by Beth’s inspiration to make a difference in the world via her experiences and knowledge gained at Saybrook. During the three days they spent together, Beth generously guided some of the conference participants in Qi gong and a shaking exercise. Experiencing these new methods to bring greater mind-body connection as well as hearing about the degree-program at Saybrook planted a seed in Helen’s head, which held fast even as Helen returned home to work and her personal and community commitments. Helen’s professional background is in corporate consulting, working for Gagen McDonald, a consulting firm focused on strategic communications, leadership development, and culture change. Helen is fascinated by organizational change and human development, and has realized over the years of working on large-scale transformations that no matter how broad the change is, it must always begin at the individual level. Helen describes her work in corporate consulting as rewarding, yet stressful. Her personal experience with the impact of stress on her physically led her to explore mind-body techniques such as acupuncture, massage therapy, and energy medicine. The personal relief she experienced through mind-body techniques coupled with her interaction with Beth fueled her curiosity. A few months after meeting Beth, during a sabbatical from work, Helen had the time to reflect upon her personal and career goals and research the programs offered in the field of mind-body medicine. She couldn’t ignore her intuition, which told her that Saybrook was the perfect fit, so she applied. In January of 2013 Helen began working toward a PhD in Mind-Body Medicine in the doctoral Practice Specialization. Helen has recently switched from a full time position to a freelance employee status in order to balance school and work, and to make time for her new marriage. Helen has always been interested in coaching, and therefore found that beginning her journey with the MBM Coaching for Health and Wellness course provided a seamless introduction for her developing career. Helen’s goal is to make life coaching a bigger part of her work as it will allow her to focus on one person at a time, providing the right environment to make a mind, body, and soul connection – one that enables true transformation at the personal, community, and organizational levels. 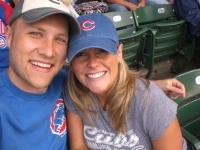 Helen and her husband live in Chicago and have been enjoying their first year of marriage doing the things they love – cooking, volunteering in the community, traveling to visit friends and family, and training for triathlons.